And this is the pic I mentioned earlier. Here we have a darling summer dress (vintage of course). 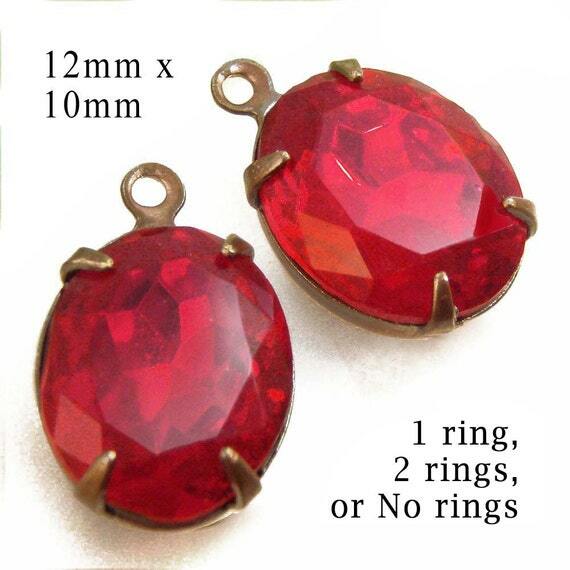 And the red jewels – just for comparison’s sake, with a couple other colors that could work. I’m going to post a pic in a little while, showing the dress – and the jewels (wish I could do it on a model! Oh well). Just so you can get the idea. Contrasts work. Simple works. 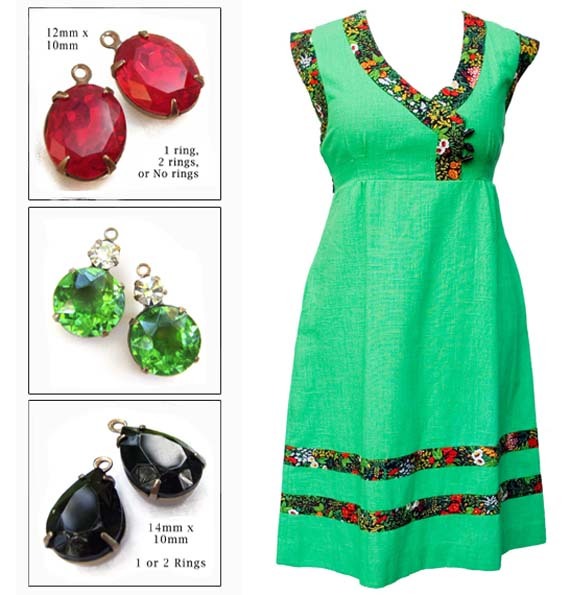 I saw this adorable kelly green vintage dress and it just popped into my head, how I would wear it. And I totally fell in love. Now first, it’s a cute dress. Next: add bright red hoop earrings. Big ones. And really high heeled sandals. Yes, just this once, because they would so totally rock. In red, or green, or black. Black patent. That’s the ticket. I don’t know if I’d leave the length “as is”, or shorten it to one of the calico bands around the bottom – would have to try it on to see. 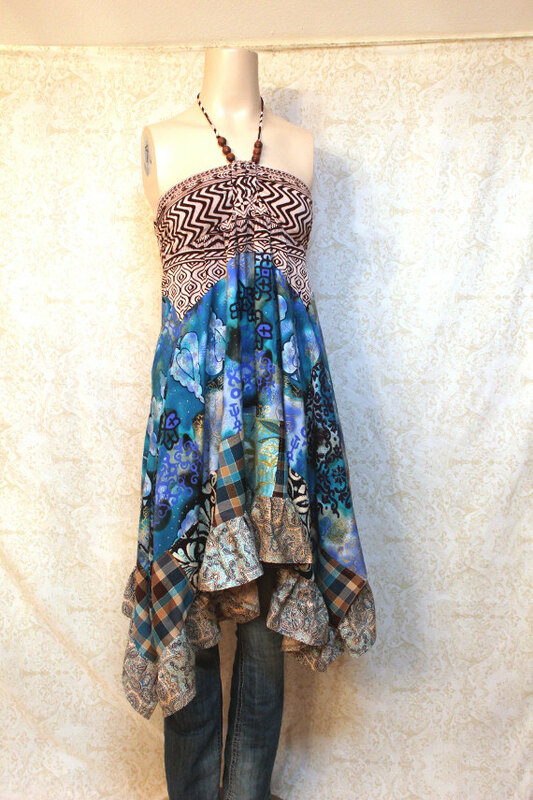 And this dress – cute, cotton, and even comfy – and it’s a “large” (yay! not a size 2!) And fun? Yes. P.S. Plus – this is important. They have a dinosaur on the roof of their brick-and-mortar. I mean, it’s worth the trip to LA! DIY. Save money. Sparkling, pretty, bridal jewels. This is all to the good! Oh my goodness! Look at these gorgeous shoes. The shop has them listed as “mules” – I’d have said, “Slides”. They’re backless heels, they’re sandals, whatever you call them, they are wonderful! Actually I think I like the name “mules”. It’s vintage too. 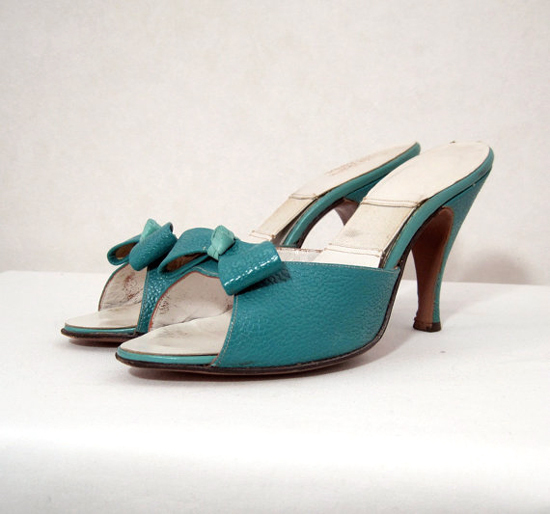 And these are that super combo of vintage style – that looks totally great today. I found these hot shoes at Vogue Vintage boutique at Etsy, and this woman has a great eye (and great prices!) Check out her orange crocheted sundress, or purple mod 1960s swimsuit, or Hawaiian batik dress, or – well, you get the idea. And right now, she’s got a “Christmas in July” sale. Check it out – you’ll love it! Stud earring jewels – these are back! 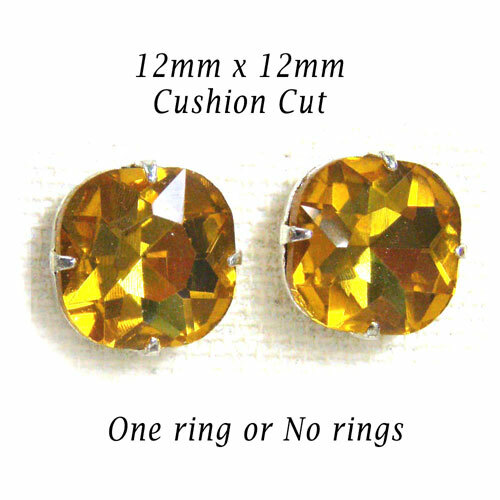 I mentioned cushion cut jewels the other day – one of the other major trends I’m seeing lately is stud earrings. Small, pretty earrings that don’t shout out loud – but look great. 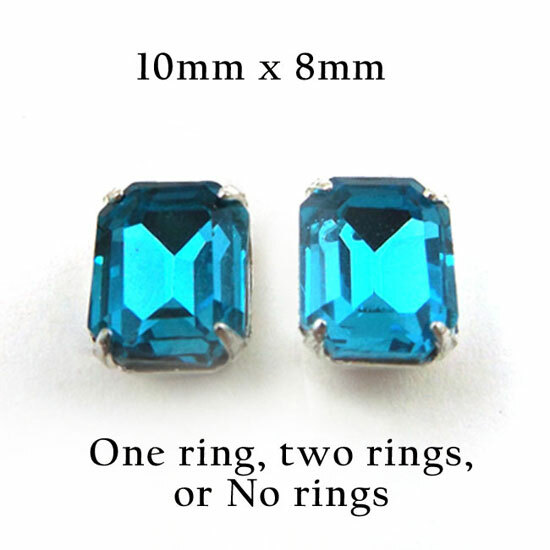 Those little jewels can be placed in one-ring, two-ring or no-ring settings. I think people are liking the no-ring, button earring styles lately because they don’t get in the way, they look girly and pretty, and sometimes it’s nice to have a change from big dangle earrings. The term “cushion cut” refers to an octagon shaped glass jewel, usually with rounded corners. 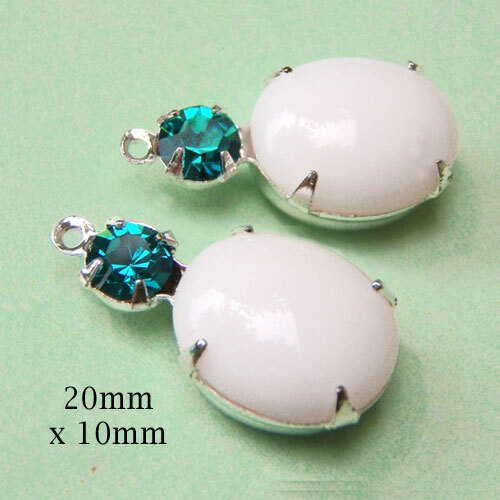 It’s a classic cut harkening back to the fine Czech glass rhinestones of the 1800s – and probably to beautifully cut gemstones for a long time before that. They’re one of the most flattering, versatile styles of stone to wear – whether glass, lucite, or gemstone. You’ll love them! We have been very lucky, here in KC. 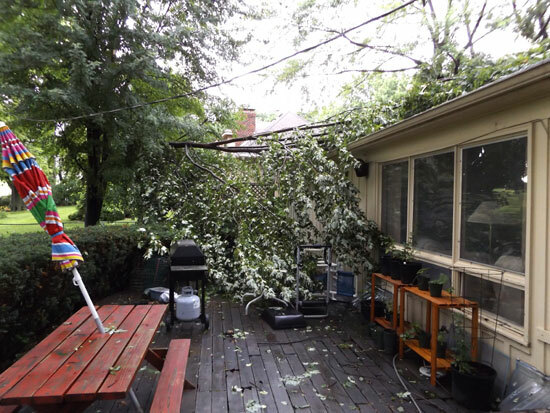 There’ve been some humongous storms this year – none of which have reached our neighborhood. Well this week we had one finally come through. Just a few days’ worth of interruption to “normal life” (you can define that however you want to, I figure as long as there’s food on the table and running water, everything else is gravy). So anyway – I am playing catchup. Last Thursday (okay, very early Friday, about 2:00 am) we had part of a tree fall on our house. And it didn’t make a hole in the roof – talk about blessed! As it fell it came through other branches, so it was gentle. Just cumbersome and big and I do have to say, it was much bigger in real life than in the pic here. Well, it seemed like it. We got it removed (a huge front-yard-filling pile of tree trunks, lumber, and branches as they were hauled away) and the only other problem was two days without power, which I’m not fond of. And three days without internet, which ditto. But some people are still without power, 5 days later. And had major roof and/or house damage. We were SO lucky.